I was in the mood for something new and frivolous. Plan 1) that new Porsche Boxter S. B did point out, however, that it was $56K, would screw up our carpool parking and I would still need to find something for a blog post. Well, one must be true to the carpool. So, plan 2) hunt around for something with rum. Enter the Beachcomber Cocktail. I found it in that venerable classic of the bartending world, The Joy of Mixology. Gary Regan claim that this version is a reformulation of Trader Vic’s 1948 recipe. Shake with ice and stain into a chilled cocktail glass–tiki is nice if you have it. “So, what about it?” you ask. Well. Frivolous is a pretty good word. I like it. It’s light; it’s refreshing-ish, but it is a bit sweet. That much triple sec and Maraschino compared with lime juice will do that. Regan invites reformulation so let’s have at it. I would first lose the Maraschino. It’s already too sweet. I would then cut the triple sec back to 1/2 oz. This is still going to be sweet. 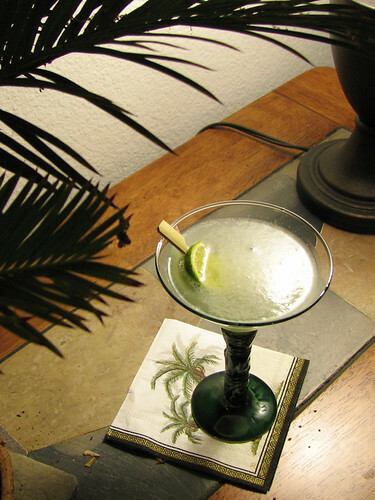 The problem is you could just leave out the triple sec but then you have a daiquiri-a legendary cocktail in its own right. So for this to be its own cocktail, I think we have to have enough triple sec to essentially leave this in the sour drink category. I am still debating the Maraschino though; I vacillate. May have to try it both ways next time and see. The other option is to double the amount of lime juice, but then the rum starts to get lost. We’ll next time thought of Porsche start dancing in my head, I guess I’ll tinker.